Savvy homeowners today choose metal roofs because of their durability, sustainability, and overall versatile aesthetic look. Their value and fifty plus year guarantee bring additional value when factoring in initial steel roofing prices and installation. A metal roof adds to the value of any home. What maintenance is required for metal roofing? The overall maintenance of a metal roof depends on the quality of the initial installation. The steel roofing prices initial cost from a professional contractor includes installation and materials. In many cases, a metal roof can be installed over an older roof. However, if you want to guarantee a quality low-maintenance roof for a lifetime, the quality of the initial installation needs to professional. Why? Experienced professional installers will spend the extra time needed to ensure that each component is properly installed. They will find ways to minimize any additional damage, find weak areas in your roof, and ensure that each section of your roof is installed to the highest standards possible. Regular professional maintenance once a year or even by an experienced homeowner can identify the most common problems. Among these problems are leaking, dents and scratches, degrading, and galvanized corrosion. A professional service will identify key areas that need replacement or repair before the problem becomes costly. While this is mostly an aesthetic issue, be sure that you keep the metal roof clean. Keep it clean of debris and dirt to maintain a clean new look for decades to come. Keep gutters and drains clear to avoid water accumulation, which can lead to damage long-term. 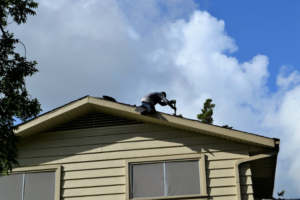 If you live in a climate with extremities in weather like high winds, snowstorms, hurricanes, hail, extreme heat or cold, and frequent temperature fluctuations, having a professional inspect your roof for structural issues will minimize any damage. In most cases, there should not be any structural issues. However, if there is a large hail storm or your home has been through some especially inclement weather, then an inspection can help address any damage immediately. Follow these steps to enjoy your metal roof for decades to come.